These peel and stick 2-sided decals are printed on calendared vinyl. The solvent inks provide UV protection for up to 3 years and are weather and scratch resistant. 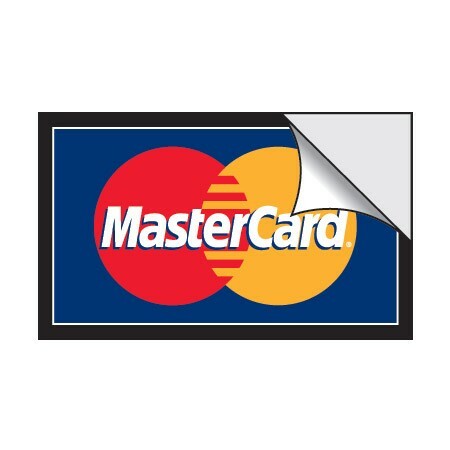 Available standard logos: MasterCard Visa Discover Amex Specify logos when ordering - others available upon request. 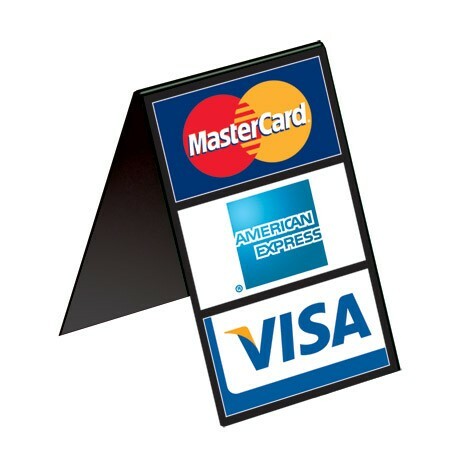 This counter sign is perfect for tight spots on a retail counter or any desire location. 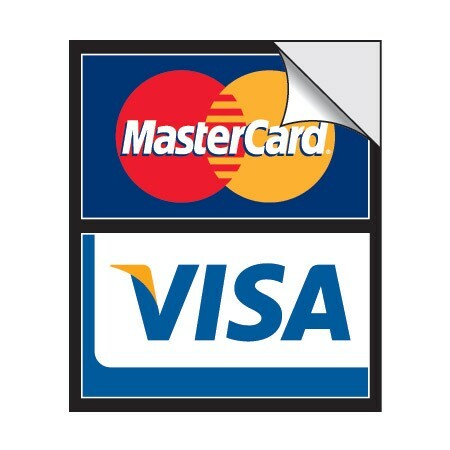 Size: 2-1/2"w x 3"h Available standard logos: MasterCard Visa Discover Amex Specify logo when ordering - others available upon request. 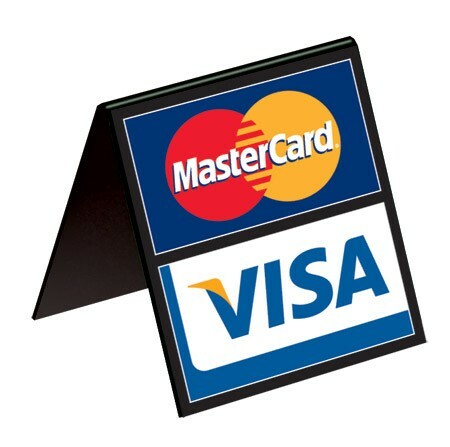 This wall sign comes with 2-sided tape for mounting. 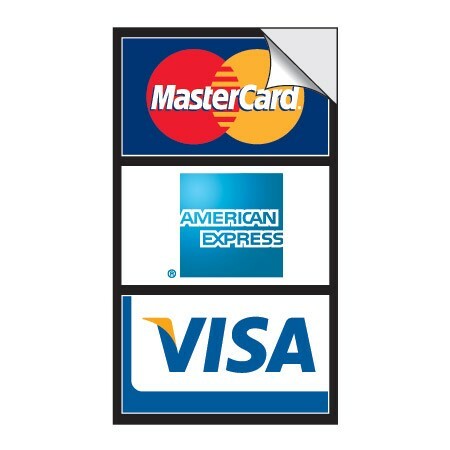 Size: 2-1/2"w x 3"h Available standard logos: MasterCard Visa Discover Amex Specify logo when ordering - others available upon request. Use these sign holders for your graphic posters! These wall frames are made from high quality polished black & clear acrylic. Graphics slide-in easily from the top of each clear pocket allowing you to display them in any arrangement of your choice. Holds (2) 8.5"x11" signs. Measures 18-7/8w x 12-5/8h. Shown in clear. Imprinting available for this product. Customize with your logo! Image shows clear model. 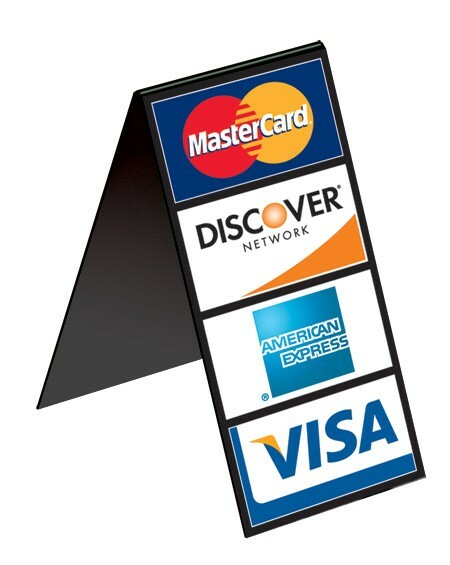 This counter sign is perfect for tight spots on a retail counter or any desire location. 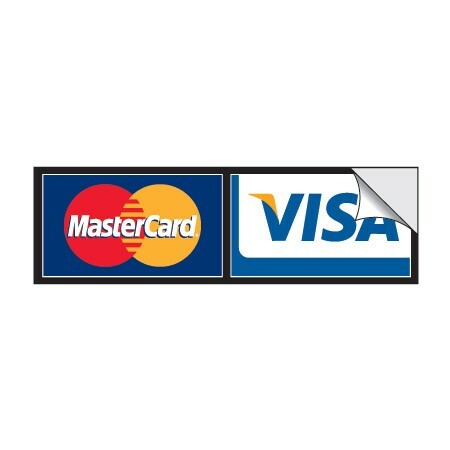 Size: 2-1/2"w x 4-1/2"h Available standard logos: MasterCard Visa Discover Amex Specify logo when ordering - others available upon request. 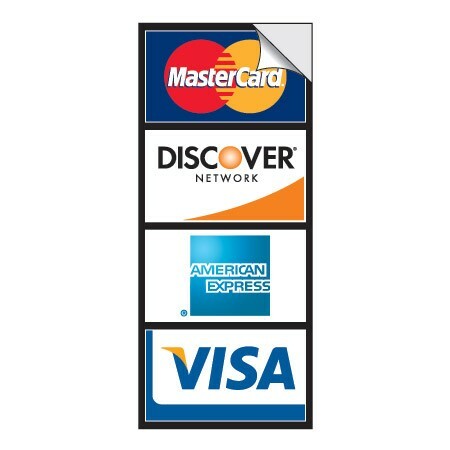 This counter sign is perfect for tight spots on a retail counter or any desire location. 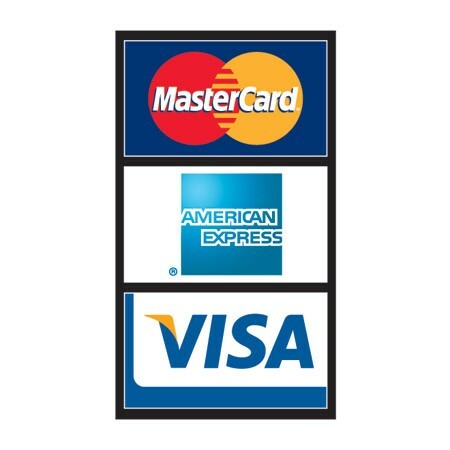 Size: 2-1/2"w x 5-7/8"h Available standard logos: MasterCard Visa Discover Amex Specify logo when ordering - others available upon request. This wall sign comes with 2-sided tape for mounting. 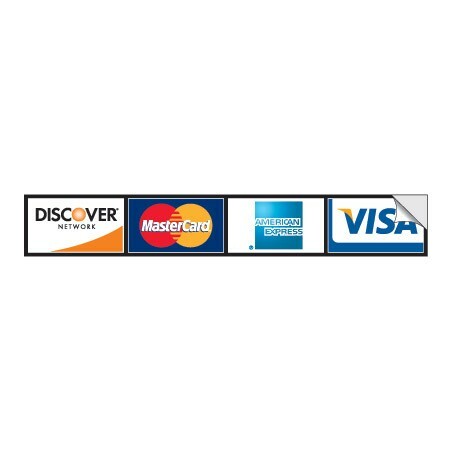 Size: 2-1/2"w x 5-7/8"h Available standard logos: MasterCard Visa Discover Amex Specify logo when ordering - others available upon request. These peel and stick 1-sided decals are printed on calendared vinyl. The solvent inks provide UV protection for up to 3 years and are weather and scratch resistant. Decal will ship as seen if no logos are specified. 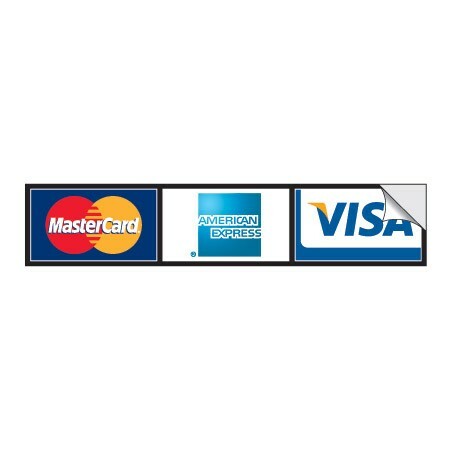 Available standard logos: MasterCard Visa Discover Amex Specify logos when ordering - others available upon request. These peel and stick 2-sided decals are printed on calendared vinyl. The solvent inks provide UV protection for up to 3 years and are weather and scratch resistant. 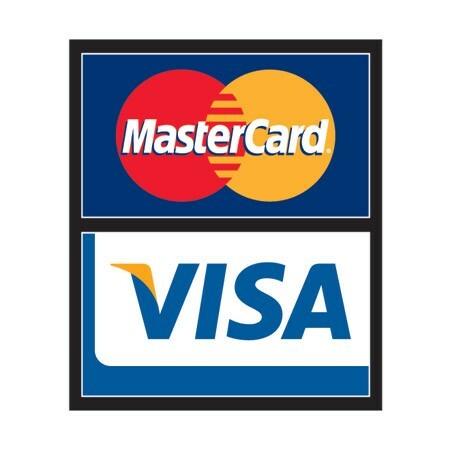 Available standard logos: MasterCard Visa Discover Amex Specify logo when ordering - others available upon request. Use these sign holders for your graphic posters! These wall frames are made from high quality polished black & clear acrylic. Graphics slide-in easily from the top of each clear pocket allowing you to display them in any arrangement of your choice. Holds (2) 8.5"x11" signs. Measures 18-7/8w x 12-5/8h. Imprinting available for this product. Customize with your logo! Image shows clear model. 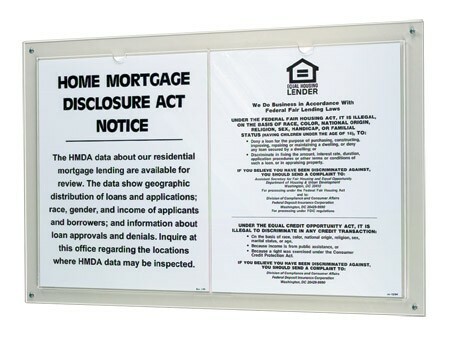 This wall sign comes with 2-sided tape for mounting. 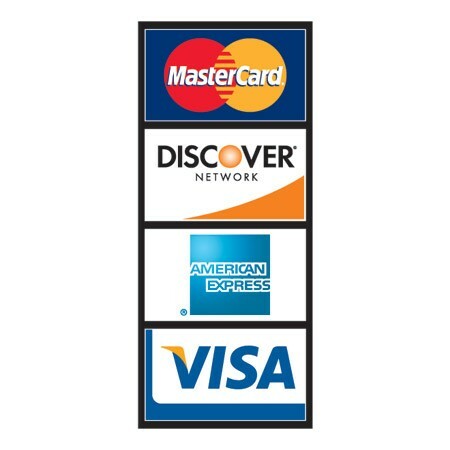 Size: 2-1/2"w x 4-1/2"h Available standard logos: MasterCard Visa Discover Amex Specify logo when ordering - others available upon request.